Other distinguishing features: White/yellowish skin from being dead and reanimated. Story: Little has been revealed about Cabbot Stones background. Indications are that he originally was a costumed adventurer. The first time he was killed was fighting the Psychofant . Cabbot was revived and made a part of Operation: Knightstrike. Not a lot has been revealed about his time in Knightstrike. He met Yuki, who was also a Knightstrike operative, with whom he fell in love, and he was eventually killed again . After he was killed on a mission with Operation: Knightstrike, he was reanimated once again for the organization Bloodstrike as an operative [1-10]. Bloodstrike was a disaster. Missions going bad and the director having hidden agendas as he was also part of a criminal organization. When the director of Bloodstrike, Noble, was revealed as an agent for the Covenant of the Sword and executed , Bloodstrike was discontinued. 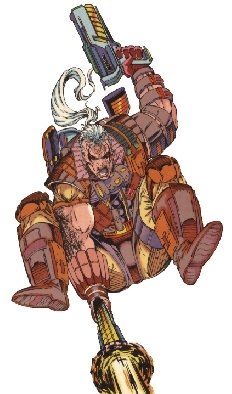 After Bloodstrike, Cabbot became an operative for Mars Gunther and his organization the Purifiers under the codename Bloodstrike . It was revealed, that during this resurrection they had used Nu-gene radiation (the mutagenic properties of the Nu-gene converted into radiation) and revived his dead tissue meaning he became alive instead of undead as was normally the case in resurrection . Seeing his ressurected Bloodstrike team killed off once again, he left the Purifiers and went solo . While taking time off, Yuki found him, getting him to remember part of his past with Operation: Knightstrike . Gunther and Solomon ended in a fight for control over the Purifiers with Cabbot, Bailout and Athena caught in the middle [16-18]. At some point Cabbot and Yuki managed to get away and get som peace and quiet, and even get married. But it did not last for long, and Cabbot was once again dragged into the fight between Gunther and Solomon. It has not been revealed how, but Cabbot apparently died and was revived once again, and immediatly found himself caught in the fight between Gunther and Solomon who ended up killing each other . The fate of Yuki and Cabbots current whereabouts is unknown. Skills & abilities: Cabbot Stone does not have any powers except for the enhanced strength provided by the reanimation process. It was revealed that Cabbot had the Nu-gene, but his Nu-gene ability was not revealed.